Product prices and availability are accurate as of 2019-04-23 14:02:42 UTC and are subject to change. Any price and availability information displayed on http://www.amazon.com/ at the time of purchase will apply to the purchase of this product. Double Ended MH 1000 Watt Bulb is NEW improved horticulture lamps use super high output technology to achieve maximum vegetative growth and maximum flower yield. Double ended MH bulbs are known to be brighter and more efficient than standard MH bulbs, and our MH DE 1000 watt grow light bulbs don't disappoint. Unlike standard MH bulbs, Our double ended bulbs are powered from both ends for even firing and operation, givng these bulbs a longer lifespan than standard bulbs and a stronger output, too. The best part- double ended bulbs have more light output without more power than conventional bulbs. With a much higher and stronger blue spectrum output, your vegging growth will increase. If you're looking to grow bigger, stronger, and more efficiently you want a double ended bulb. 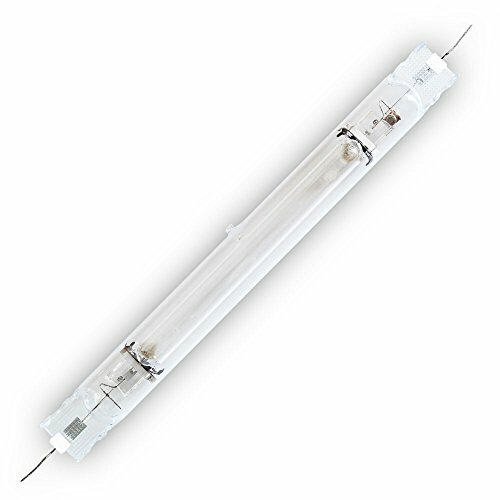 For your double ended bulb needs, Suluxlight's got you covered.Specifically designed for high frequency electronic ballasts. High Frequency, Pulse-start Digital Lamps featuring premium quartz glass for enhanced spectrum and penetration to your plants which results with higher quality and yield! NOTE:The jacket of this double ended lamp is made from quartz glass. Do not handle with bare hands. Oil from your hands can damage the lamp.